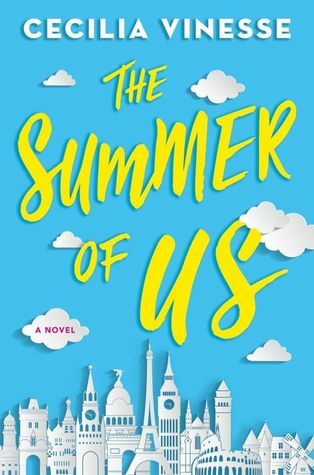 Synopsis: A swoon-worthy story about five best friends on a whirlwind trip through Europe, perfect for fans of Jenny Han, Stephanie Perkins, and Jennifer E. Smith. American expat Aubrey has only two weeks left in Europe before she leaves for college, and she’s nowhere near ready. Good thing she and her best friend, Rae, have planned one last group trip across the continent. From Paris to Prague, they’re going to explore famous museums, sip champagne in fancy restaurants, and eat as many croissants as possible with their friends Clara, Jonah, and Gabe. But when old secrets come to light, Aubrey and Rae’s trip goes from a carefree adventure to a complete disaster. For starters, there’s Aubrey and Gabe’s unresolved history, complicated by the fact that Aubrey is dating Jonah, Gabe’s best friend. And then there’s Rae’s hopeless crush on the effortlessly cool Clara. How is Rae supposed to admit her feelings to someone so perfect when they’re moving to different sides of the world in just a few weeks? Author Cecilia Vinesse delivers a romantic European adventure that embraces the magic of warm summer nights, the thrill of first kisses, and the bittersweet ache of learning to say goodbye to the past while embracing the future. Review: This was such a fun book! I loved the fast-paced telling of the story as we follow the group of friends across Europe. Not everything goes as they planned and I was pleasantly surprised to see how it all worked out in the end. I really appreciated the characters and how convincingly Vinesse paints each of them. I especially adored Aubrey because I really connected with her. I was always the worrier/studious one of my friends, but Aubrey has the guts I wished I would have had in high school. She isn’t just the “mom” of the group, but has flaws and makes some difficult decisions. Her best friend, Rae, is super adorable too and I would love to read more about what happens to her character after the book ends. Overall this was a great read and perfect for taking along on your summer vacation! Thank you so much to The Novl for sending me a copy to review! Please note: All links marked with (*) are affiliate links. Meaning, if you click and make a purchase I will get a small percentage of the purchase price from the retailer. Purchases like these help support my blog!